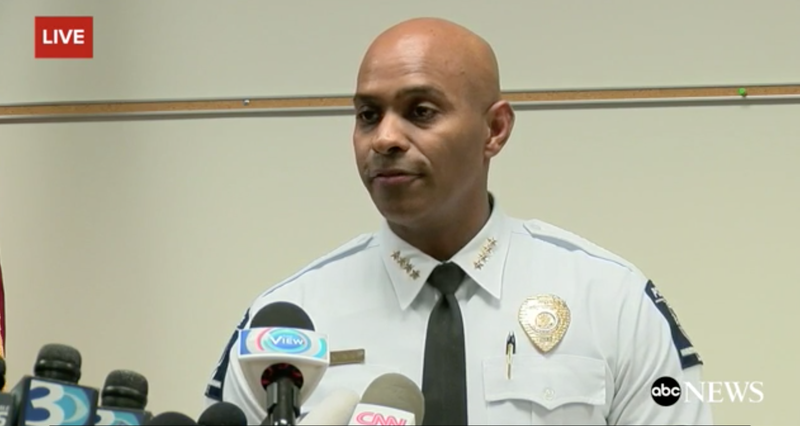 Charlotte-Mecklenburg Police Chief Kerr Putney told reporters on Saturday that his department will release video footage from police body cams and dash cams of the fatal shooting of Keith Lamont Scott. The footage will appear online sometime Saturday evening. Scott was shot and killed on Tuesday in Charlotte, North Carolina by cops who came upon him sitting in his car in the parking lot of an apartment complex they were while searching for a different man with an outstanding warrant. What happened next is unclear. Scott’s family has said that he was unarmed and reading a book in the car, waiting for his son to come home, when cops approached him. Cops claim that Scott was holding a gun. According to CNN, Putney claimed the decision to make the video public had nothing to do with Scott’s widow releasing cellphone footage she took of the shooting on Friday. This video does not show whether Scott was in possession of a handgun at the time of the shooting, as cops have claimed. Putney stated on Thursday that the body cam footage does not “definitively” show events the way cops claim it happened.